Through today or while supplies last, you can get $50 off your booking of a hotel stay of $200 or more when you pay with your MasterCard at Expedia.com. Dates of travel must be between June 28, 2016 and August 31, 2016. Use coupon code CL9K0R2QCIAL for this discount. Note: This coupon is not valid at Hilton, IHG, Marriott, Starwood or Millennium & Copthorne hotels. JetBlue announced last year that it would be parting ways with American Express as its co-branded credit card partner. Instead, new cards would be issued by Barclaycard and processed on the Mastercard network. Today, JetBlue finally released details of its new suite of credit cards, including information about its new customer sign-up bonuses which require relatively little spending. Not sure what to get the gamer on your holiday shopping list? Today, December 3 only, you can get $15 off your purchase of $50 or more on video games at Rakuten when you check out with MasterPass. One great deal this allows you to get is a PlayStation Plus 12 month membership card for $35. This offer is part of the 12 days of MasterPass promotion where Rakuten offers different discounts each day for 12 days when you check out and pay with MasterPass. 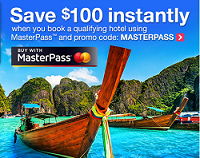 For a limited time, you can save $100 off a qualifying hotel purchase of $100 or more at Orbitz when you use MasterPass and promo code: MASTERPASS. You must book a qualifying standalone, pre-paid hotel stay that costs $100 or more with travel occurring between September 18, 2015 and September 30, 2015. This promotion cannot be applied to previously made bookings. 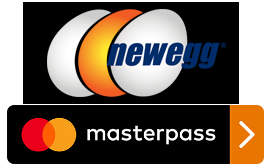 This offer is only available only while supplies last and only on desktop and mobile web where MasterPass is an available payment option. In the aftermath of the massive data breaches at Target and other retailers, the interest in credit card security has grown significantly. Pushed by consumer demand for more secure card technology, Target announced earlier this year that it was accelerating its plan to rollout all its credit and debit cards with “chip and PIN” technology by early 2015, with new payment terminals appearing by September 2014. However, it is Sam’s Club, a subsidiary of Wal-Mart, that will be the first major retailer in the US to offer secure chip technology in its credit cards. This week, MasterCard announced that it will be changing its rules to offer broader protections from fraud and identity theft to its US cardholders, by officially expanding a couple of its fraud protection programs. If you have a Hawaiian Airlines credit card from Bank of America or Bank of Hawaii, there are some significant changes coming your way. Hawaiian Airlines will soon be switching existing cardholders to either the Hawaiian Airlines World Elite MasterCard for consumers or the Hawaiian Airlines Business MasterCard for small businesses, using Barclaycard as the issuing bank. While the transition will result in more fees, cardholders will also enjoy a number of new benefits. A few of the major changes include: an increase in the annual fee to $89 and a free checked bag privilege if you use your card to buy the ticket. These changes will become effective April 28, 2014. Current cardholders are expected to receive their new cards in the mail in mid-April. Do you feel like you shouldn’t need to pay for shipping when you shop online? If so, you aren’t alone. Forrester Research’s recent “US Online Holiday Retail Forecast, 2013” found that consumers have come to expect free shipping, particularly during the holidays, and many will leave a site if it’s not offered. Given that more and more spending has shifted online–according to ComScore, online sales grew by an astounding 20% on Cyber Monday–it’s not surprising then, that some payment providers have begun experimenting with offering free shipping to differentiate their service and attract that spending.